My little "pet project" over the last little while, so to speak, has been ROM hacking Sonic R, the less-than-loved racing game from 1997. Why? So I can make it better. It has potential, it just needs a bit of work. One of those "bits of work" happens to be fixing some glaring issues. Now, even though I titled this series "Sonic R Bughunting", Sonic R is a rather glitch-free game. It will pretty much never crash via normal gameplay, or abnormal gameplay at that. The problem is that it was programmed in a bit of a rush, and it shows. Some things simply weren't thought out as well as they could have been. For example, the player's interaction with sloped floors is a bit flawed. First, let's explain a few concepts. Characters (up to 5 of them) have all of their information stored in RAM. This includes the character's location, direction, identity and velocity, among many, many other things. The location information in particular is modified by a function I'm calling "CharacterDifferentation", or "CharDiff" for short. CharDiff is called for one character at a time, and takes the chunk of memory containing that character's information as input. The function takes the character's identity, looks it up against a table of known coefficients for various attributes (Acceleration, turn speed, etc.) and puts it in local memory to work with later. This allows it to a different acceleration and top speeds and the sort for Sonic compared to, say, Tails. It then looks at the character's environment and actions: Is the player jumping? Underwater? On ice? On a slope? If the character is currently in any of those situations, it modifies the coefficients accordingly. For example, on ice, the player's turning speed and traction is cut in half, making it harder to control the character. The problem with that line of thinking comes with things like hills and banked curves. On slight inclines like these, the expectation is that the player follows them. The player should speed up when going down a hill, slow down when going up one, turn with a curved road, etc. And the player does... if the slope is larger than the cutoff point. You see, the cut-off point was designed so that when you're standing still or just starting to move, you don't slide down a shallow hill, but you do slide down a steep hill. However, this logic is being applied no matter what you're doing on that slope. Because of this over-generalization, things like small hills or banked curves do absolutely nothing. You'll just plow straight though them as if they were flat ground. 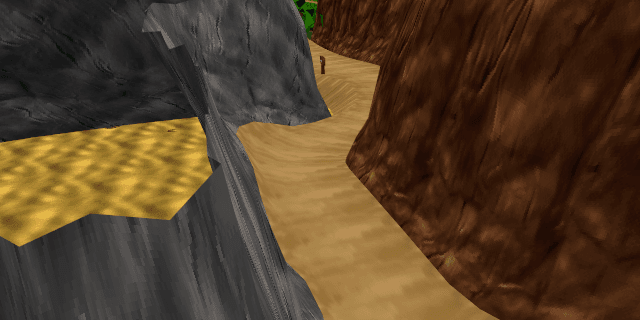 The most prominent example of this is in Resort Island, in the canyon bit. This is normally impossible to cross without slamming into a wall, because the banked turns don't guide you past the walls as expected. As Jontron puts it, "I have to give [the developers] credit, because they programmed MAGNETS into the walls." Now, how would you fix such a thing? You can't get rid of the cutoff, or else Sonic will fall flat on his face every time he stops on something as simple as a handicap ramp. My proposed solution is to only apply the cutoff when the player is under a certain speed. It makes sense logically; you tend to have more footing when standing still compared to when you're running, where a misstep could send you to the ground easily due to your momentum. This speed cutoff should be fast enough so that the character has enough momentum to not immediately fall off the slope they were just standing on, yet slow enough so that strategically slowing down won't completely mess up physics. mov     eax, [ebx+40h]  ; In water? test    byte ptr [ebp+Input+1], 10001b ; Accelerating with fwd or button? Of course, this is no magic bullet to fixing the game. Let's not pretend these tiny slopes are going to make a huge difference. However, it does make the game just feel a little better to play.